A tanulmány-kötetet 2012. szeptember 29-én mutatták be a londoni Freud Múzeumban. 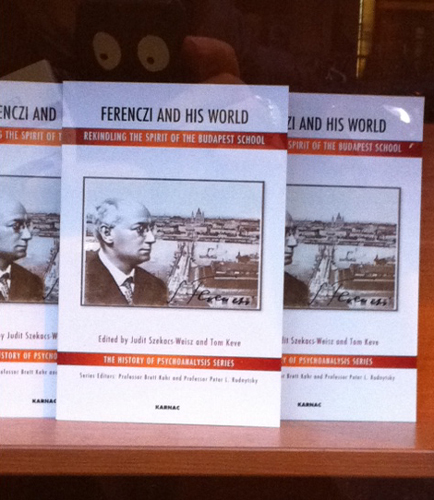 Ferenczi for Our Time presents contributions from British, French, American and Hungarian analysts of the second, third and even fourth generation, who deal with different dimensions of experiencing the external and internal world. These papers explore linkages between Ferenczi and the works of Winnicott, Klein, Alice, Michael and Enid Balint, the British Independents as well, as French analytical thought related to Dolto and beyond. The reader will also become acquainted with original documents of a revived Hungarian psychoanalytical world and new voices of Budapest. ‘The Balints’ chapter invites the reader to listen to colleagues sharing memories, recollections and images - allowing a personal glimpse into the life and professional-human environment of these extraordinary personalities. The topics discussed here are wide ranging: possibilities and impossibilities of elaborating social and individual traumata, child analysis and development, body-and-mind and clinical aspects of working with psychosomatic diseases. Functions and dysfunctions of societal and individual memory are explored as signifying ‘blinded’ spots in our vision of external and psychic reality as well as the vicissitudes of generational transmission of trauma. The scope of these papers covers methodology, theory and clinical practice. Előkelő helyet foglal el a Karnac népszerűségi listáján , a Judit Szekacs-Weisz és Tom Keve szerkesztésében megjelent tanulmánykötet, amely immár eBook formában is megrendelhető. See more Karnac Review, New books for spring 2012, p. 26.